Remember how I totally stole that Grinch scarf that I was going to send to my brother for Christmas? But I do feel kinda bad about not sending it to him. Kinda - but not enough to actually give it up and send it. So I had to make something equally as good to send him. I seem to be stuck on scarves for almost everyone on my Christmas list this year and I found a pattern for this awesome scarf. Check it out! Lego Bricks! I think I've redeemed myself, no? 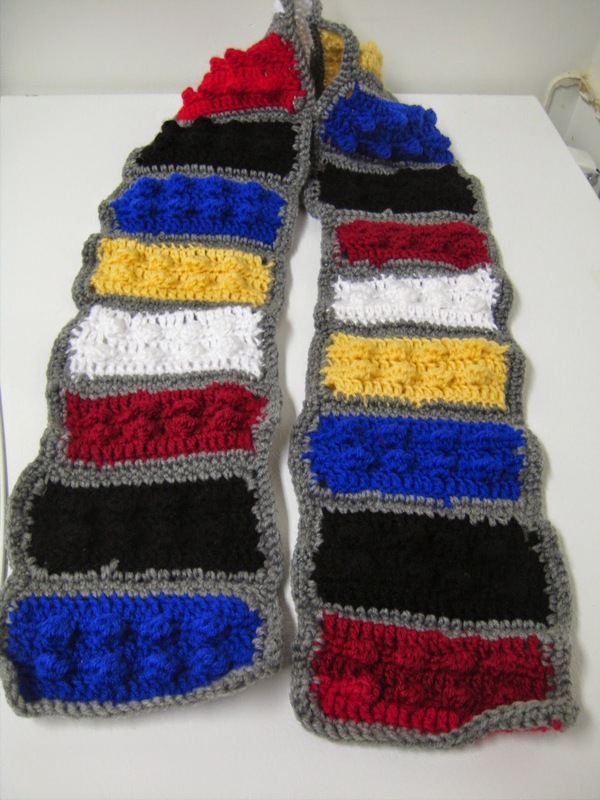 I used this pattern to make the Lego Brick Scarf. The actual bricks worked up really fast and then I stitched it all together. It's going to be super warm. Not sure if my brother will actually need a scarf, but it would make a pretty cool decoration thrown over a couch top or something anyway. A link to my Lego Brick scarf project on Ravelry. I'm getting close to the end of my Christmas gift making frenzy. Woo! How is everyone else doing on their lists?